Interest rate isn’t the only factor that can drive up your projected new monthly mortgage payment. Private mortgage insurance (PMI) and the term of the loan can also make a big difference in what you pay each month. So that lower interest rate loan you’ve been offered — adjusting for mortgage insurance and a shorter-term loan — will actually make for a higher payment. Here’s what to watch out for when considering a loan with mortgage insurance or a shorter-term loan. PMI (also known as simply MI for mortgage insurance) is the cost imposed by the lender if you have less than 20% equity when purchasing or refinancing a house. This can add up to several hundred dollars per month on your monthly mortgage payment beyond principal, interest and taxes. The smaller down payment you make, the higher your monthly mortgage payment; conversely, the opposite holds true. The term is the total number of months it takes to pay off the mortgage in full from the time the loan funds until payoff. For example, a 30-year fixed rate mortgage takes 360 months to pay off. The longer the term, the lower the payment — but the more interest paid over the total life of the loan. The shorter the term, the higher the payment — and the less interest paid over the total loan life. If your objective is to get an affordable mortgage payment, don’t base your decision on interest rate alone without taking into consideration the loan term and mortgage insurance (if it applies). An FHA-insured loan is one of the priciest types of standardized mortgages available today. These loans have an upfront mortgage insurance premium, which commonly is financed over the life of the loan, however it can be paid upfront with cash at closing. This adds an additional layer of premium to the mortgage over the loan life. The percentage amount of this is important to remember: a whopping 1.75% of the loan amount is what will be calculated when determining what your principal and interest payment is based on. Additionally, there is a monthly mortgage insurance premium based on 1.35% of the loan amount. 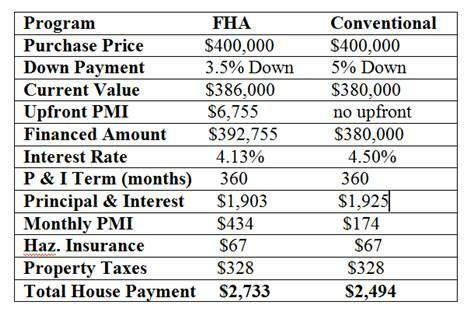 Assuming all other factors are constant, getting a conventional loan for the same $400,000 home requires a slightly higher down payment and a slightly higher interest rate than with the FHA loan. However, with the conventional loan, there is no upfront mortgage insurance premium and the monthly premium is based on .54% of the loan amount, for a total reduction of $239 per month. In other words, for a slightly higher down payment up front, you could have a lower monthly mortgage payment for the same sales price. The interest rate is higher, but the monthly payment itself is lower. If you opt for a short-term loan, your monthly payment would be twice the amount that you would have with a standard 30-year fixed-rate program. This is, of course, because the amortization term for a payment based at 360 months is going to be substantially lower than a payment based on half the amount of time. For a 30-year fixed-rate loan amount of $386,000, assuming an interest rate of 4.5%, a principal and interest payment is $1,925 per month. Compare that against a 15-year mortgage at 3.25% — a principal and interest payment is $2,712 per month. The $787 per month difference represents the additional monthly prepayment going to principal in exchange for being mortgage-free in 180 months. Shorter-term loans, such as a 15-year fixed-rate mortgage, or even a 10-year fixed-rate mortgage, do offer lower rates than the traditional 30-year counterparts and rightfully so, these mortgages are typically harder to qualify for because more income is needed to offset a higher payment, along with stronger credit. (This is why it can be helpful to have a stronger credit score, or have a plan – which you can get for free through Credit.com – to work toward a higher score, before you take out a mortgage.) Additionally, because the loan is being paid off faster, the investor returns are greater due decreased payoff risk. Wall Street has a greater appetite for these financing types than 30-year mortgages, which are typically refinanced or paid off every five to seven years. By using payment rather than interest rate as the driver to decide on a mortgage program, a consumer in the market for a mortgage could better manage the payment for longer-term sustainability. How Financially Strong Is Norwegian Cruise Line Holdings Ltd. (NYSE:NCLH)?